Ever since this story broke: http://uk.news.yahoo.com/wenn/20071212/ten-foster-s-sexuality-under-spotlight-a-c60bd6d_1.html about Jodie Foster and her girlfriend, I have been getting inundated by hits because of a story I wrote back in September about Jodie, who I shot at her premiere, and Cindy Bernard who was not there as I noted http://hughe2030.blogspot.com/2007/09/jodie-foster-shows-up-at-her-premiere.html . Last week the Hollywood star paid tribute to "my beautiful Cydney" as she accepted an award from The Hollywood Reporter at Los Angeles' Beverly Hills Hotel. It is the first time she has made reference to her relationship with film producer Cydney Bernard, her reported girlfriend of 15 years. Maybe it wasn't Queen Latifah who was the one getting married? 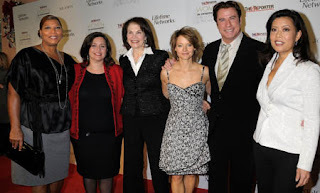 Why can't Jody Foster date Queen Latifah and have John Travolta as their houseboy? Dr Starling move over - I found Jodie Foster's next movie Oscar-winning role! Dr. Jill Bolte Taylor who wrote ""My Stroke of Insight"" and delivered a talk about it on TED.com that will knock your socks off! The video's been seen 5 million times and I understand why. Taylor was a Harvard trained brain scientist who suffered a massive stroke. I don't think we'll ever hear a story like this - Taylor understands how the brain functions and she was able to observe her mind deteriorating. She writes about the euphoric nirvana and a sense of complete peace and well-being she discovered in her stroke! She talks about this in her incredible (don't miss it) talk on TED.com. The book is great too - highly recommended. You'll learn how to 'step to the right of their left brain' to uncover a deep internal peace. Sign me up!